If you’re going all out with your Halloween celebrations this year, good for you! We love Halloween here at Linen Rental. It’s a great excuse to dress up, and we’re expecting a big surge on our black tablecloths and chair covers! White tablecloths spattered with fake blood or red food colouring is a great way to dress your tables. Zombie apocalypse or vampire attack? Leave your guests to decide! Whether you need to print guest lists, menus or name cards for your tables, choosing a spooky font will add an edge to your event. There are plenty of Halloween fonts available, including those that mimic gravestone engravings and dripping blood. What Halloween bash would be complete without some dripping candles on the table? If you are worried about a fire hazard, there are many LED dripping candles available, and the best thing with these is that they can be used again next year. Recreate the dark and dank feel of the midnight graveyard with moss table runners and gravestone table decorations. A smoke machine swirling smoke around your guests’ ankles will only add to the ominous feel. This is a fun idea for your napkins, especially if you are having a vampire theme. Get some white plastic vampire teeth and use them as napkin holders for folded red napkins. If you're going for a monochrome look this Halloween, why not give your pumpkins a dark and deadly transformation by painting them with glossy black paint? Mini pumpkins or squash work well here, especially when arranged as a table runner interspersed with a few white skull decorations. Okay, this might not be appropriate for guests with a ophidiophobia - that’s a fear of snakes - and so you might need to tread carefully. Plastic snakes make great Halloween table decorations, and can be entwined around glasses, left slithering along the table, or used as a name card holder with the card held in the snake’s mouth. Looking for a fabulous centrepiece for your table? Look out for plastic cauldron decorations, or make your own, and fill them with green, orange or purple LED battery operated lights. If you can get hold of some dry ice, this will add to the effect, but make sure you follow the instructions properly as this material can be dangerous. If you’re going for a gothic feel for your party, a horrific, yet glamorous centrepiece is called for. White roses are beautiful, but are instantly transformed into a nightmare with a sprinkling of plastic bugs, spiders and cobwebs. This is one for the brave. Decorate each table with old fashioned artefacts such as old timepieces and cameras. These can usually be hired from prop companies for a good price. In the centre of each table place an ouija board with instructions. Will they dare you use it? That is the question. 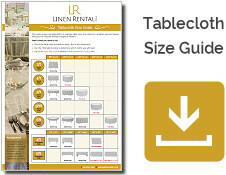 Your tables may be dastardly, but it doesn’t mean your linen has to be. With our quality tablecloths, napkins and chair covers, you can create the perfect blank canvas for your Halloween props and decorations.